FB bit of kit – most value for money AR item for many years here . Have logged over 300 LF NDBs , 56 DGPS beacons and quite a lot of HF traffic up to 18MHz . Last evening I had 3 decodes from VK6XT at 14,872km on 3.5MHz WSPR and decodes from K3RWR and AA3GZ on 1.8MHz . This is a new product that was designed primarily for the RSGB Convention 2016 SMD Workshops, but nevertheless makes a very useful addition to any receiving station. The system has a good response from below 20kHz to over 30MHz, yet is simple to build and install. You can download the full EFP Assembly Manual here. See the update document on EFP Mounting here. This discusses measurements on conducting and non-conducting supports, as well as alternative methods of finishing the RF part of the probe. The necessary end caps for 32mm waste pipe are now available from stock – but beware when buying the 32mm pipe!! Not all pipe marked ’32mm’ is 32mm outside diameter! As a product, the EFP is available as an SMD level kit (EFPK), or an assembly kit (EFPAK). There is also an optional hardware kit (EFPH). The SMD kit, EFPK, has the PCB, all the SMD components and some 0.5mm solder wire for those who want the pleasure of building from component level. The Appendix to the Manual contains the instructions for assembly. For customers for whom working with 0805 size SMD components is a step too far, then the assembly kit, EFPAK, comes with all the SMD’s already mounted on the PCB, and basic operational testing carried out for you. You are free to decide how you want to house and install the E Field Probe. The two parts come as a single PCB with a score line, so you can crack the two apart. The probe must be mounted externally to pick up the signals and connected by coaxial cable to the bias tee, which provides the DC power for the probe. 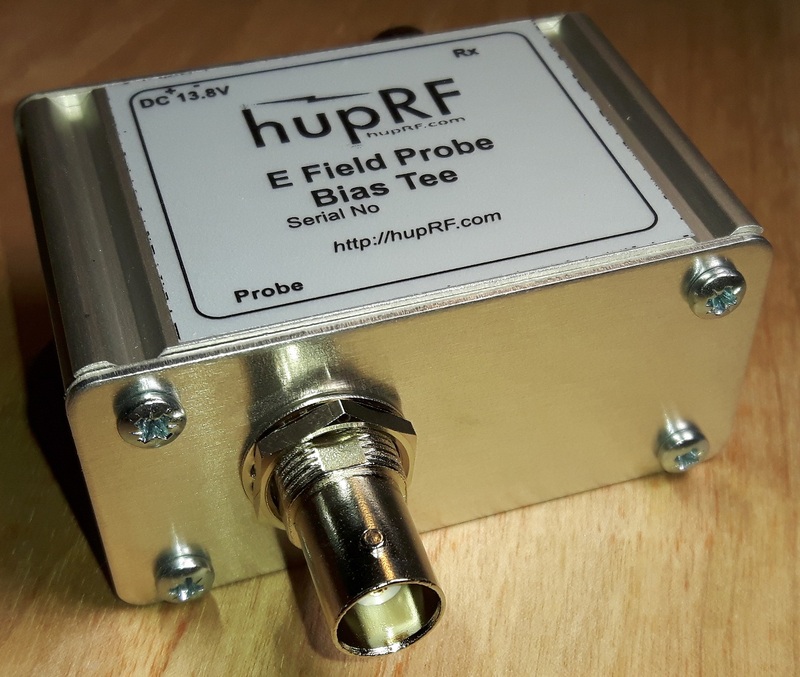 The RF signal out of the bias tee is connected to the receiver input. An optional hardware kit, EFPH delivers all of the connectors and cases needed – the picture below shows the bias tee mounted into the extruded aluminium housing. The hardware kit includes the end caps for standard 32mm waste pipe mounting of the probe part. Full drilling details for the extruded case are included in the EFP Assembly Manual. There are many on the market, and most are compatible with more that one software package. 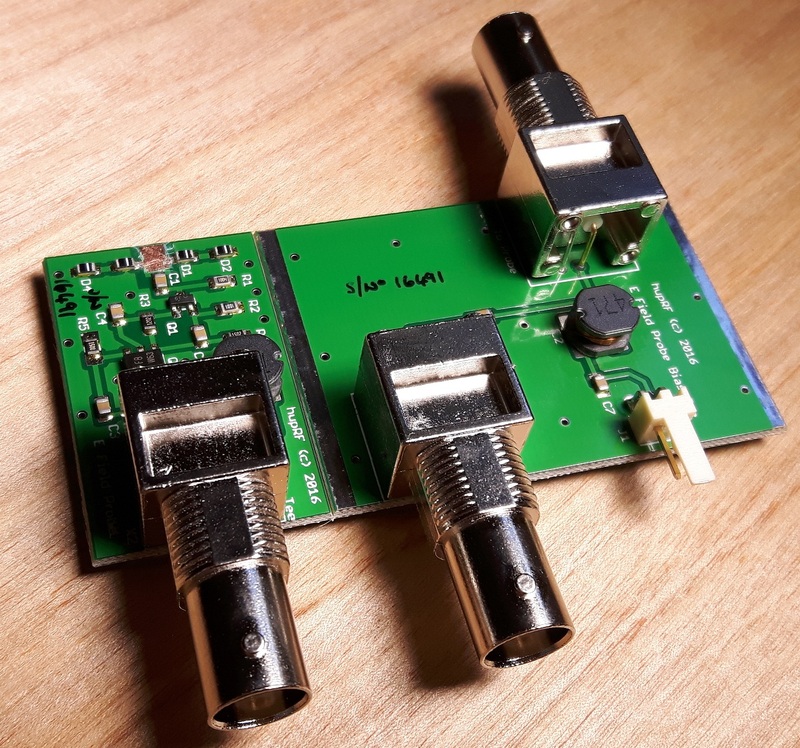 Based on availability, economics and performance, hupRF recommends the SDRplay range as suitable SDR’s for use with the E Field Probe Active Antenna. Click on the link below to go to theSDRplay website – SDRuno software is also downloadable from the site.